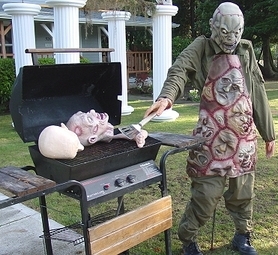 Cooking of the victim has very seldom been observed in recent cases of human flesh eating. This cannibal shows class and proper étiquette. "This is all great publicity for us! It's awesome to see someone who enjoys a low-calorie, ice-cold beer made for the Ultra life while chewing a protein-rich face and eyeballs. Modern people are taking care of their diet and have an active lifestyle, and the Cleveland Face Eater is a prime example of today's active family man: he chose some young subjects, whom he knew he would have to chase down for a while. The blokes didn't let go of their faces easily, making for great cardiovascular exercise and as they say, you are what you eat, so it's worth catching a fast one. It's all very compelling viewing." Another well-publicized and somewhat disconcerting instance of cannibalism occurred at the Idaho House of Representatives, where Congressman Tee Bone (R) was savagely attacked by the Speaker of the House right in the middle of a lengthy speech about the new system of gradation of bovine meat for small producers. The Speaker's sudden and ferocious attack was reminiscent of a school of piranhas in a feeding frenzy. As it turned out, Mr. Bone was posthumously awarded a B- rating according to his own gradation system. "HIS GODDAMN SIRLOIN WAS TOO SHORT AND HE HAD STONES IN THE LIVER!!!" the demented speaker shouted relentlessly while being chased by a battalion of wildlife officers wielding nets normally meant for catching grizzly bears. "A few individuals approached the students who were sitting on the grass, one of the newcomers shouted "HUNGRY!" and with no further ado, they started feasting on the flesh of the poor lads. Officer Smith and I could not believe our eyes! It was like a scene from Cannibal Holocaust. We took a few steps back to blend in better with the surrounding populace and had to listen to the cries for help from the four students. I remember Officer Smith telling me after a few minutes of chewing and grunting: "What has the world come down to when people are eaten alive right in the middle of the city and nobody does anything..." Our work shift was supposed to stop at 8:00 PM but we stayed there until 8:30, at which time only bones were remaining and the cannibals were looking for another meal, so we made a bee line to the cruiser." "What a sick world we live in!" concluded the exasperated officer. This page was last edited on 28 August 2012, at 06:08.